Jiva Goswami (Sanskrit: जीव गोस्वामी, Jīva Gosvāmī; c. 1513 – 1598) is one of the most prolific and important philosopher and saint from the Gaudiya Vaishnava school of Vedanta tradition, producing a great number of philosophical works on the theology and practice of Bhakti yoga, Vaishnava Vedanta and associated disciplines. He was a member of Six Goswamis of Vrindavan, being the nephew of the two leading figures, Rupa Goswami and Sanatana Goswami. Jiva travelled to Navadvipa in West Bengal and met with Nityananda Rama, one of the foremost followers of Chaitanya mahaprabhu. Nityananda took Jiva to all the holy places in Navadvipa and they circumabulated the entire area together. This marked the beginning of the Gaudiya tradition of Navadvipa parikrama (circumabulation of the nine sections of Navadvipa). After the pilgrimage, Nityananda gave his blessings for the young Jiva to proceed towards Vrindavana. It was in his Sarva-samvadini commentary to the Six Sandarbhas of Hindu philosophy that Jiva Goswami first wrote of Achintya Bheda Abheda, the philosophy of Chaitanya Mahaprabhu. In essence, the philosophy of Achintya bheda abheda, or "inconceivable oneness and difference", avoids the extremes of Shankara's monistic Advaita vedanta and Madhva's pure dualism (Dvaita) by interpreting the material and spiritual potencies of the Supreme Person (Bhagavan) as being simultaneously one and different with Him. 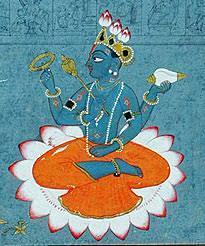 Rasamrita-sesa: A work dealing with Sanskrit composition. Jiva has based this work on the Sahitya Darpana of Visvanatha Kaviraja, but has used many examples of his own as well as examples from other Goswamis. Gopala Viduravali: A short poem by Jiva extolling the glories of Gopala (Krishna) in 38 verses. Laghu Vaishnava Toshani: The Laghu Vaisnava Toshani is Jiva Goswami's commentary to the Bhagavata Purana. Krama Sandarbha: The Krama-sandarbha is a commentary on the 10th Canto of the Bhagavata Purana. Jiva Goswami died in 1596 CE (or 1618 according to some biographies). His samādhi (tomb) is located in the precincts of the Radha-Damodara temple in Vrindavana. ^ Das Thakur, Narahari. 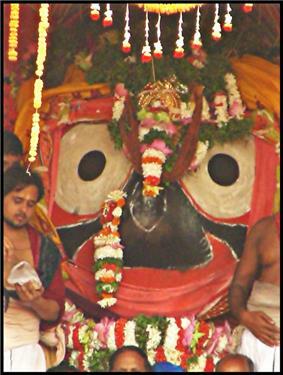 Bhakti Ratnakara. Ras Bihari Lal & Sons. 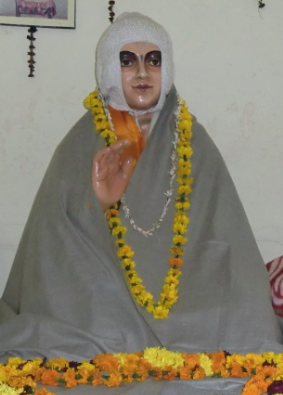 ^ Tripurari, Swami. "The Life of Sri Jiva Goswami". Harmonist.